Too busy to exercise? Not with a 10 minute workout! When it comes to exercise, our bodies respond to exercise on a continuum, not an allotted timeframe so even if you only have 10 minutes to exercise it can make a difference if you keep it up every day. Research has found that short bursts of exercise lasting 10 minutes give you the same health benefits as working out in the gym for hours. Working out for just 10 minutes a day can help strengthen your immune system, burn extra calories, and elevate your mood for the entire day. 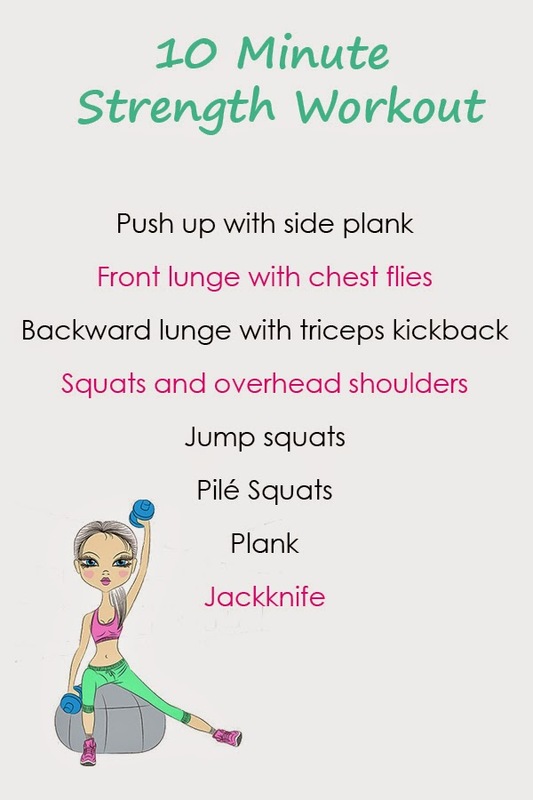 These short workouts also help to promote healthy blood flow, strengthen the heart, and clean out the system by pushing toxins out of the body through the lungs and lymph nodes. Scheduling your 10 minutes a day can be easy. We’ve created four workout plans tackling strength and cardio and two of these plans you can do during your work day! The other two you can do first thing in the morning or before your evening meal at night, this way there are no excuses not to get at least 10 minutes of exercise in! Spreading these quick 10-minute workouts throughout your day can elevate your heart rate, get you breathing hard, and stimulate a toning effect on the muscles without requiring you to slave away for long periods at the gym. The key to exercising for a short period of time is consistency and high intensity in order to get significant results. We also suggest doing exercises which target major muscle groups at once through combining lower and upper body exercises. BENEFITS: A high intensity exercise routine to get the heart racing, boost metabolism and burn calories. BENEFITS: These resistance exercises tone the key muscle groups and strengthen the bones and joints. 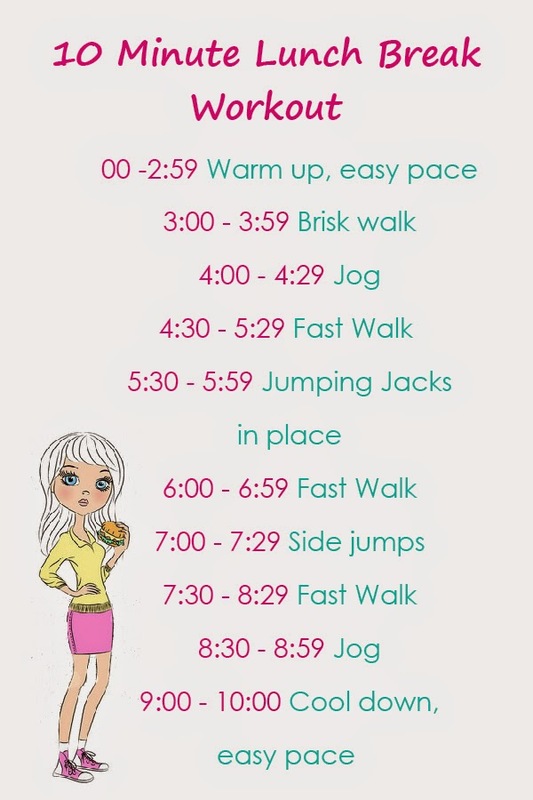 BENEFITS: Take your trainers to work with you and do this light routine based on interval training to get the heart pumping and the fat burning. BENEFITS: ‘Deskercise’ boosts energy levels, improves posture and relieves back ache. It’s not for the self-conscious and your co-workers may give you a few odd glances but it’s worth it to get your toning in and it reduces your time of sitting at your desk which is dangerous for your health. Always warm up before you start to exercise. Start with simple stretches and dynamic moves like neck circles, shoulder rolls and knee bends. If you suffer from joint pain, or want to prevent joint pain in later years try taking a Glucosamine supplement to help nourish cartilage and increase the lubrication in your joints and to reduce stiffness. When doing jumping jacks or skipping, try to land lightly on your feet to absorb the force of impact. Bend your knees as you land which creates a soft landing. Cool your body down at the end of a workout with stretching. 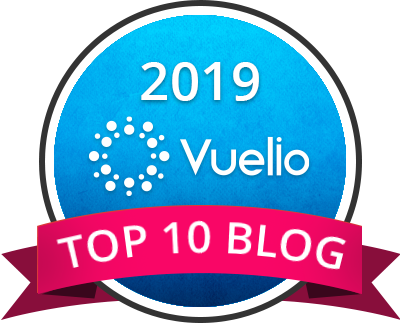 Sitting down for long periods each day is extremely damaging to our health, but unfortunately, this is a real concern for many of us due to our lifestyles and work environments. Evidence shows that just 10 minutes of intensive exercise each day can benefit the body in many ways, helping to reduce the negative side effects of sedentary lifestyles. This range of exercises is designed to meet different needs and requirements, but all are suited to people with time constraints. Complete just one of the intense 10 minute workouts each day to make the most of the limited time you have available and to stay in the best possible health. There's always 10-2 minutes to spare. Way to get it done! Love this! There is always 10 minutes! Love the 10 minute desk routine- printing it out to share! Thanks! Thanks Mary Beth 🙂 please do share! 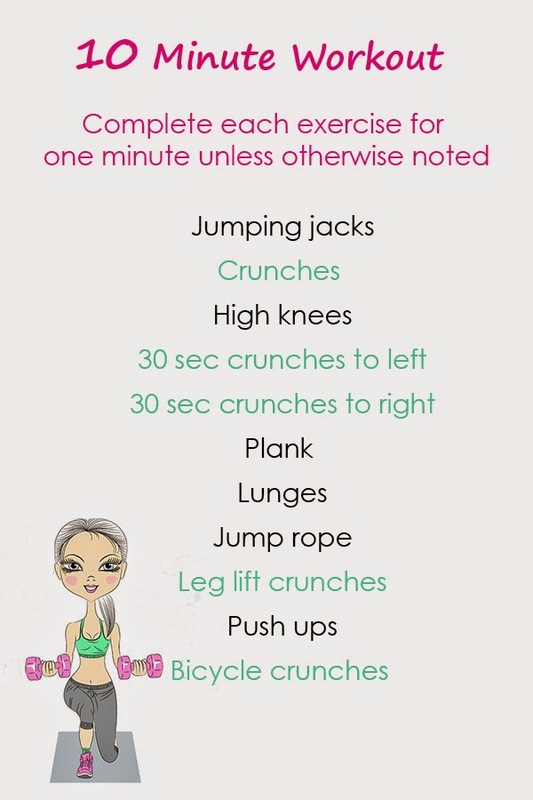 Loving these 10 minute workouts! Some of my best workouts are the quick & intense one! I agree! Have ached for days after some seriously quick workouts!